There is much about this ten metre Naiad that catches the eye, but nothing exceeds the impact of the two immense outboards on the back. 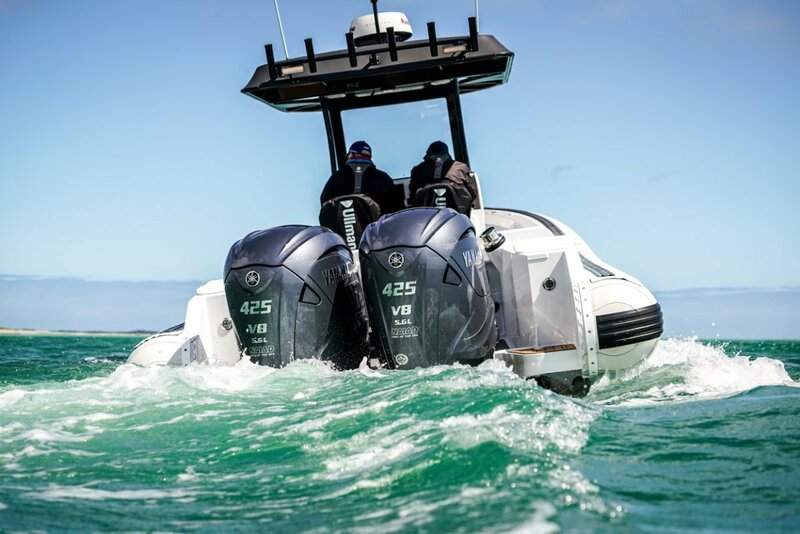 This is Australia’s first installation of the 425hp Yamaha, the all-new motor that is crammed with matching technology. The hull is the latest version of the big Naiad, with foam filled D-section collar and raised aluminium sheer line. 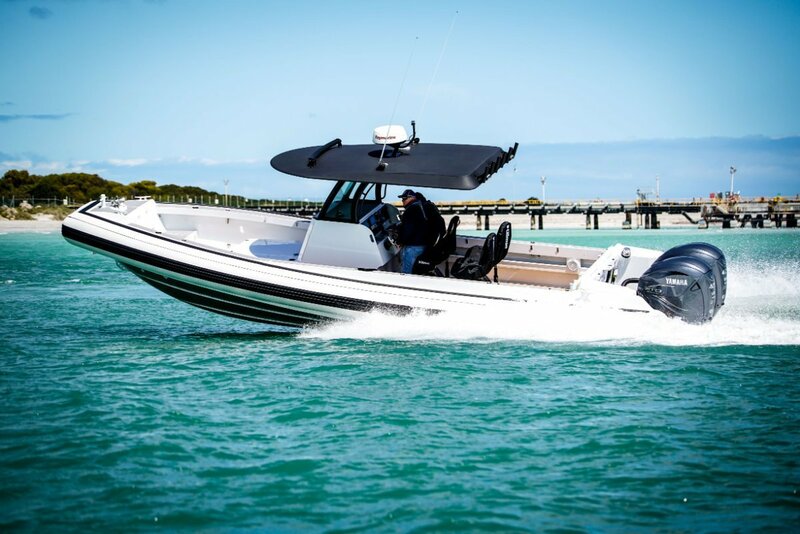 With the centre console layout it has vast amounts of clear space: this is the all weather fishing boat to dream about. The centre console, although in scale with the hull, is a big capacity structure housing the fridge and a toilet. Rather than using it also for bulk stowage – that way toilet use tends to get crowded out – a day bed ahead of the console absorbs vast quantities beneath itself. A heavily framed fabric T-top cantilevers long distances fore and aft of the console, shading four Ullman suspension seats. The supports carry a full height armour glass windscreen. Those seats are likely to be the only ones filled on serious fishing days, but the total seating capacity is much higher. The day bed is probably good for three, the bow seat one, and the folding lounge right aft will take another four. On those fishing days the lounge can be completely removed. Fishing preparations would include fitting coaming bolsters onto the built-in clips and deciding in which of the multiple positions to initially fit the bait board. A near infinity of rod sockets is laid on, and side pockets along half the length can handle fishing odds and ends. Kirbys were early users of pot haulers, and their installations are now models of neatness, efficiency and unobtrusiveness, extending to special stowage for the hauling arm. Genuine timber or cork deck sheathing is losing, or has perhaps lost, favour. Cost, complexity of installing timber and the absorbent properties of both have fuelled the shift to advanced synthetics. This deck used computer-cut Ultralon sheathing with a timber-look pattern. Its closed cell composition is excellent underfoot and simply cleaned by the boat’s sea water deck wash. The dash is laid out to suit a high speed boat. The high tech engines have every type of monitoring built in, not requiring frequent eyeballing of gauges. Speed, though, requires constant forward lookout so the important stuff for the fishers – the pair of large screen combos – is mounted as near the eye line as possible. Like everything else on board the electronics are right up there: Axiom by Raymarine, stereo apparently from a theatre. Driving seat relationship to the wheel is good, helped by an adjustable steering wheel. As well as providing shade the T-top makes an under screen for the light bar, removing distracting dazzle. Just one use of a good installation like this one – picking up a Rottnest mooring say – will make a convert of you. On the subject of parking: the Naiad has a first class anchoring system that is invisible most of the time, located under the buoyant tube. Performance is as emphatic as 850hp and 11.2 litres capacity suggests. Acceleration to the mid 50s of knots seemed instantaneous and effortless, all controlled by electricity. Fly by wire is the technical term: there is no mechanical connection between boat and motor. Throttle, gear change, steering, trim and tilt, joystick control for parking and probably several other functions I was not savvy enough to grasp are all controlled via electrical wiring. The motor also talks to the GPS and can hold a position for you and even hold an attitude to the wind. But you have to catch the fish yourself, although the Naiad does take the effort out of that by providing power points for electric reels at intervals along the rails. Home base for this Naiad will usually be rack storage, but occasional trips north are also on the cards. With the right vehicle and operating under certain road traffic rules it is definitely trailable.